At the end of Matthew Hughes’ Majestrum, Henghis Hapthorn, Old Earth’s foremost discriminator, found that his intuitive other half, his own fully-formed personality inside his head, had taken a new name, Osk Rievor. This new story begins with Rievor researching the history of magic from the previous age in anticipation of the next age when magic will again reign supreme. But Hapthorn has clients to work for in order to get paid, and to Rievor’s frustration Hapthorn and his integrator – a digital assistant turned into a wizard’s familiar – head off in search of a missing person, getting captured themselves before managing to free the object of their quest, and coming away with a small spaceship under their ownership in the bargain. 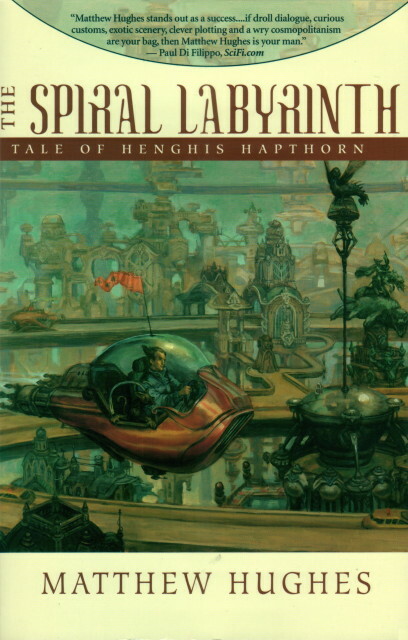 From there, Hapthorn acquiesces to Riever’s desire to visit some points of mystical power in the world, a task which seems tedious at first, but turns dangerous when their pair – plus integrator – are again captured, this time by a mysterious being controlling a red-and-black spiral labyrinth down which they walk. When Hapthorn emerges at the other end, Rievor is no longer in his head, and he’s no longer in his own world, having been thrown into a medieval period hundreds of years in the future, in the coming age of magic. Armed with only his superhuman reasoning ability, in a world where reason is at best scoffed at, Hapthorn must find and rescue his other half and find a way to return to his own time – not to mention figure out who captured them in the first place, and how to stop him from doing it again! Labyrinth is similar structurally to Majestrum in that it starts with a short mystery to show off Hapthorn’s skills, and then launches into the main story. But this one is more of a fish-out-of-water story, and features more interplay among the characters, especially as Rievor and the integrator both become better realized. Hughes has plenty of fun playing with Clarke’s third law, as Hapthorn uses his skills to perform feats of reasoning that seem like magic – and of course can be duplicated by magic in the future era. This leads to the philosophical conundrum in which he’s unable to convince people that he’s not a magician, even though they can tell he’s not using magic – there’s clearly something odd about him. The way Hughes sets up these ideas and pulls them together is quite clever, and is a big part of the enjoyment of the book. Another part, of course, is the light touch which Hughes applies to his writing style. Hughes spreads his humor around among all the characters, and Hapthorn more than anyone else is the target of the jibes of other characters. It results in a fine line that Hughes has to walk, since constantly making fun of the main character in a largely serious story can undermine the whole narrative, but the fact that Hapthorn is both very competent and also a bit full of himself means that seeing him cut down to size from time to time seems justified. The book has a more satisfying climax than Majestrum did, as Hapthorn cuts a more heroic figure than he did at the end of the first book, and the confrontation with the antagonist feels not quite so metaphysical. Hughes also proves willing to make some radical changes to the status quo of Hapthorn’s world, as two major characters undergo significant transformations at the end of the book. Not many authors seem willing to do this in serial fiction, which makes it exciting since now we can anticipate what Hughes will do with the new configuration even though we know we won’t be getting exactly more of the same. As a result, The Spiral Labyrinth isn’t so much better or worse than Majestrum as simply different, and equally entertaining on its own terms. But you can’t ask for much for than an exotic milieu, engaging characters, and amusing writing, which is what this series delivers. There’s at least one more volume in the series, and I’m looking forward to it.